On Saturday I accompanied Shantigarbha to the funeral of his Buddhist teacher, Sangharakshita — founder of the Triratna Buddhist Order and Community. It was the first time I had participated in a Buddhist funeral ceremony. Sangharakshita was 93 years old, and had started the community 50 years ago. 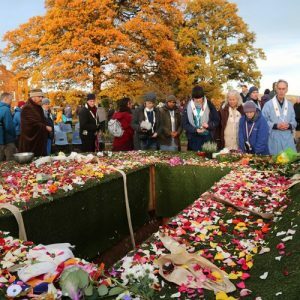 The community has grown over the years and is now spread over six continents, so people came to the funeral from all over world. It was amazing for me to hear mantras sung by 1300 voices. In general I enjoyed the atmosphere and I had a sense that I was part of a worldwide community. No borders, no Brexit! I could sense sadness and grief, and at the same time lots of gratitude, which gave me a sense of celebration. It was unusual, because I really can say that I enjoyed the day! Of course I didn’t know the founder and I never met him. Nevertheless, I could connect with the speakers’ deep gratitude for Sangharakshita’s work, his wisdom, and his new approach to practising Buddhism in Western culture. I could connect with him by hearing how he contributed to other people’s lives. I find it uplifting to hear gratitude or appreciation. In Nonviolent Communication (NVC) Marshall Rosenberg described gratitude as Giraffe Juice, or “fuel to fill up our energy tanks”. Shantigarbha and I have found a way to integrate gratitude and appreciation into our daily life. Just before going to sleep, we do Gratitude —what we enjoyed or what we feel grateful for as well from the day. Of course there’s space to share things we didn’t enjoy as well. Sometimes we are so busy in our daily life that we forget to express our appreciation or gratitude to others. Sometimes there is even something in the way. If it’s difficult to say it in person, one way to do it is to write a card. Christmas is coming, so it could be an opportunity to write something personal. In general giving and receiving gratitude is nourishing and uplifting — it’s fuel for our energy tanks. I see it as a way to contribute to other people’s lives.